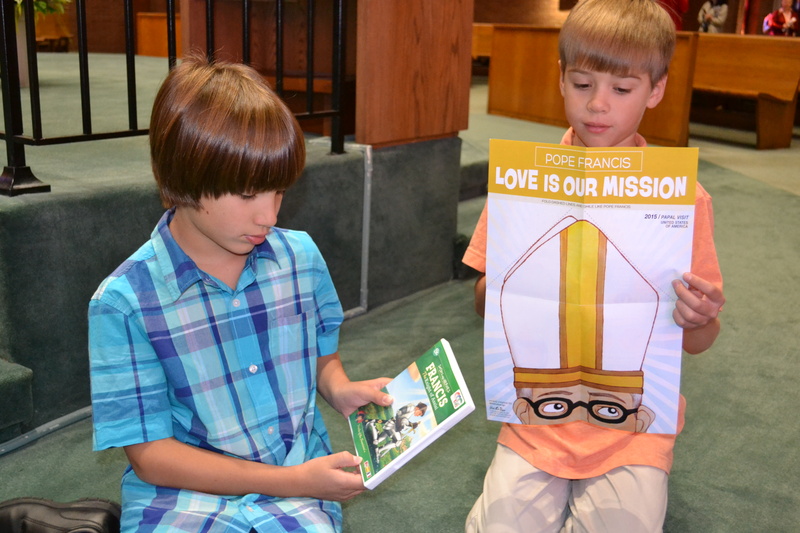 On the heels of Pope Francis’ visit to the USA, here’s a way to keep your young children enthusiastic about serving the Church by helping others. 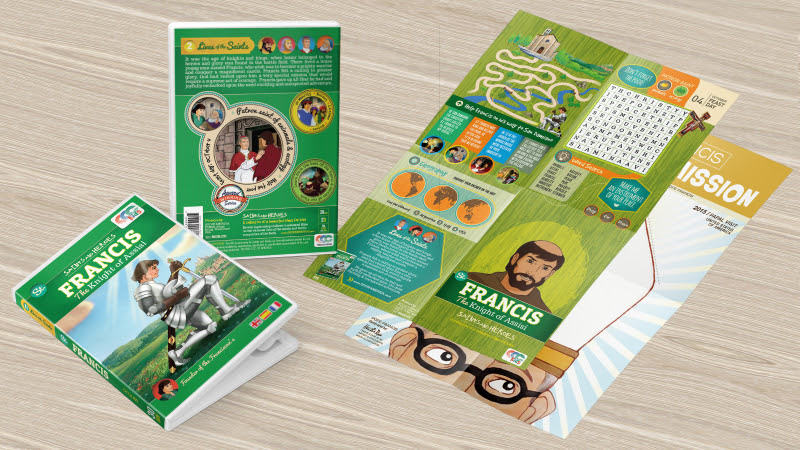 CCC of America has bundled its Saints and Heroes video about St. Francis of Assisi with a fun activity poster with puzzles and word games about Saint Francis on one side and a commemorative Pope Francis mitre to fold and wear on the other. The video, in English, Spanish and French, clocks in at just over 25 minutes and presents the story of St. Francis’ change of heart and eventual founding of the Franciscan Order in a way children 8 and under can understand. One of the best moments came in the middle of the video, when Francis’ mother tells him that “God comes first–only He can tell you your destiny;” then Francis prays in the tumbledown chapel at San Damiano and is given the commission to build up the Church. (Of course, he misinteprets this at first, and the video shows how he later learns the true meaning of his mission.) Francis is shown preaching the Gospel, especially the Beatitudes, and being kind to strangers and to the poor. 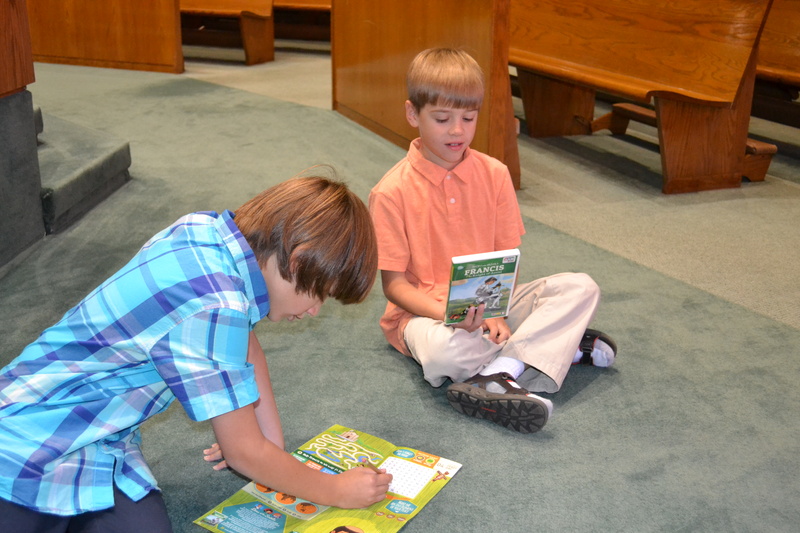 My friends’ sons, Cole and Ryan, check out the video and activity poster. As my own children are teenagers and young adults, I brought the movie and poster to church to ask my friends’ sons, who are are just the right age for the movie and activities in this bundle pack, to share their impressions of the video and poster. Their favorite part was the word-search activity on the back of the poster. This movie would be an excellent addition to a religious-education program as well as a family video library. 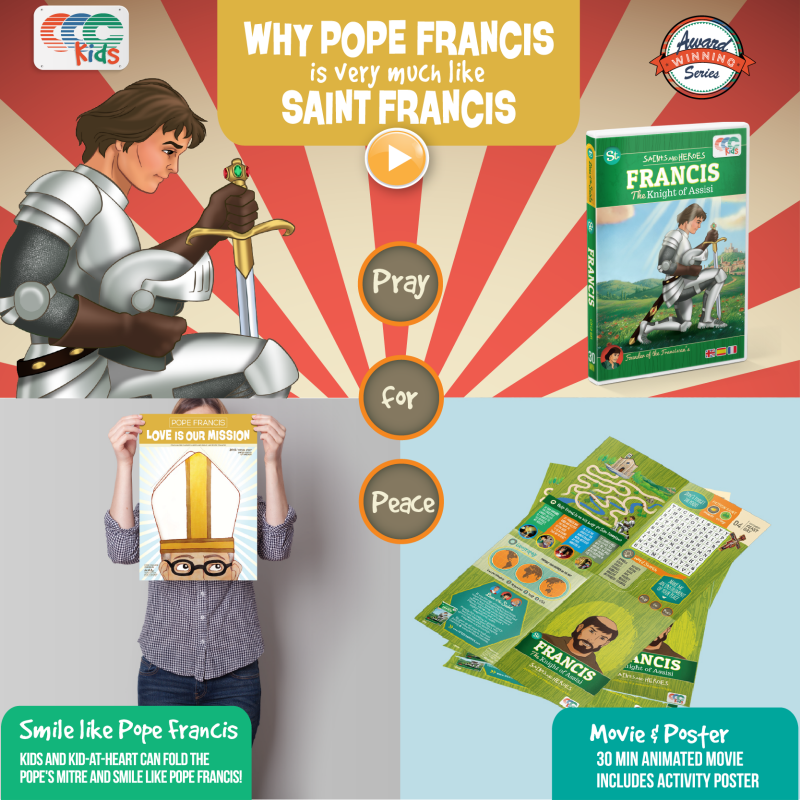 To purchase your copy of this Special Edition: Francis, the Knight of Assisi + Pope Francis Commemorative Poster at a special price, use coupon code BLOGGER30 at checkout. You’ll save 30% off the regular price! Product images courtesy of CCC of America. Other photos copyright Barb Szyszkiewicz, OFS. All rights reserved. Note: links to CCC of America are affiliate links. Thanks for sponsoring my blog through your purchase!